India recently emerged as a supporter of Sustainable Development and took many initiatives to show it's presence in this sector. While travelling through India you can see that Renewable Energy being promoted in every corner of India. 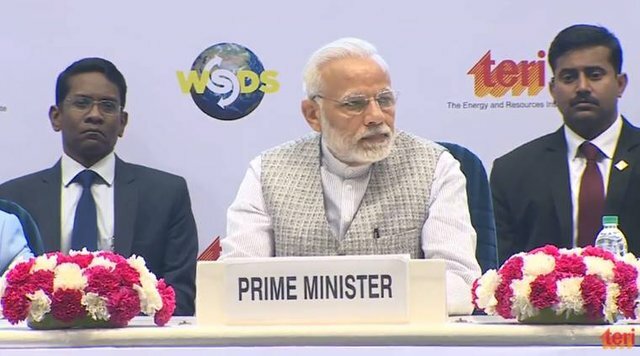 PM Modi inaugurated the world sustainable development Summit 2018 in the New Delhi. Event has been organised by the energy and resources Institute to discuss framework to resolve climate change prices in developing countries. I think it's really an essential aspect to look upon, while we generally think everything is forever but it's not the truth, if nature evolved us as super brain then we must look at the ways of smart use of resources present around us, rather than converting everything in ash. This is all for now, Thankyou guys for your visit. Feel free to post your comments. Modi govt give india a lot,i think. Yes he's trying hard, he started so many projects that were not there before. This post received a 3.150 SBD (86.31%) upvote from @upvotewhale thanks to @singhrajat! For more information, check out my profile! You got a 12.88% upvote from @upmyvote courtesy of @singhrajat! This post has received a 0.45 % upvote from @drotto thanks to: @singhrajat. You got a 2.76% upvote from @postpromoter courtesy of @singhrajat! This post has received a 0.31 % upvote from @booster thanks to: @singhrajat. This post has received a 0.50 % upvote from @morwhale thanks to: @singhrajat.